Volkswagen made a big impression with its 1960’s “Think Small” campaign, and the famous 1962 “Lemon” ad is still associated with the brand fifty years later. Your Volkswagen may not be a lemon, but if it has any performance issues whatsoever, then Menke’s automotive is the best place for your vehicle. We treat your investment with the utmost care, from the fun to drive iconic Beetle to the luxurious Eos. As the top foreign car repair specialists in the Evansville and Newburgh area, we are Volkswagen lovers, and we have everything you need to get your VW running in perfect condition. When you walk into our service facility you will receive courtesy and respect by our friendly staff as they discuss your repair and maintenance needs. German factory approved diagnostics are available right here in Newburgh. Menke’s is fully equipped with the latest in technology and system analysis techniques to help your Volkswagen return to peak status. Our staff training is continually updated on the newest information and industry trends, so you know that we’ll never be behind the times on exactly what your car needs, no matter what the problem. Menke’s can always be trusted to offer the best service in Southern Indiana. techniques. 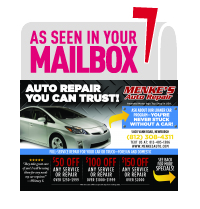 In 2009, Menke’s was named the top automotive repair business in the country out of 165,000 shops. Since then, we’ve continued to strive for superior excellence in the automotive field. There’s no wonder that we’re the only AAA Approved Automotive Repair Shop in the area. Exceptional service means more than just getting your car back in perfect condition. It means a comfortable waiting room environment, free wifi, full cable television, and free loaner cars while your Volkswagen is in the garage. You can depend on Menke’s to minimize the inconvenience of being without your vehicle by offering benefits beyond what most car repair facilities offer. Come to Menke’s once, and you’ll be a repeat customer. The friendliness, competence, and professional attitude of the staff will keep you coming back. If you drive a foreign car in Newburgh, find out why Menke’s is leading the way in automotive repair.